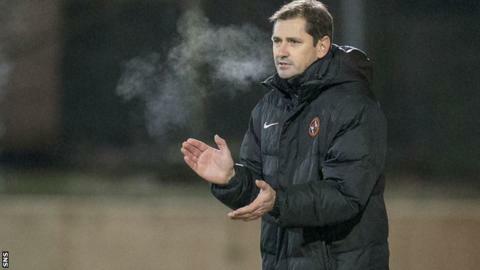 Jackie McNamara reckons Dundee United's attacking firepower gives them an edge over Aberdeen in Saturday's Scottish League Cup semi-final. The Tangerine's have scored 46 times in the Scottish Premiership this season - more than any other top flight side. "We've got goals in the team," the United manager told BBC Scotland. "I think we've shown that. "But defensively we need to be a lot better than we have been of late - we've conceded too many sloppy goals." Dundee United, who rejected bids for midfielder Stuart Armstrong on Thursday, have conceded 30 times in the league so far, with Hamilton being the only top-six side to have leaked more than McNamara's men. The former Partick Thistle boss has recently signed Ryan McGowan to help tighten things up at the back, and he has also strengthened his attacking options with the addition of Estonian forward Henri Anier. However, it is the on-the-day form of another striker which McNamara feels will be crucial when they meet their New Firm rivals at Hampden. Nadir Ciftci has netted nine times in all competitions during this campaign but has struggled for steady form, and McNamara hopes he will see the Turk at his best on such a significant occasion. "That's the big question," he said. "I'm sure everyone's looking at Nadir and wondering what you get with him. "When he's on his game, I don't think there's any better striker in Scotland - his all-round play, his strength, use of both feet, pace and he can finish. "Consistency would be the downfall, but this is the stage you want him to go and show his ability. He's handled it in big games before and we're hoping the big players can go and do the same on Saturday." Tannadice has been another huge factor in Dundee United's success this season, with only one loss - to Aberdeen - in 12 matches on their home patch. Reliable away form has not come so easily for the Tayside club, but McNamara is not worried about them faltering at Hampden. "You look at the surroundings and it should be fantastic for the players," added the former Celtic player, who also had a short spell at Aberdeen in 2007. "You want to play in big games and I think we've done well in the big games this year. We've handled live television games well - at Celtic, the Dundee derbies and at Aberdeen on the first game of the season. "This is a great chance to play at the national stadium with our team to try and get to the final, albeit a big ask against a really strong Aberdeen side, but I believe we're capable of doing it."